The cover. What do you think? So, some of you will know I’ve been writing a little book. 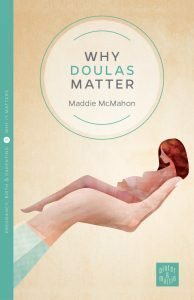 It’ll be little in size and word count – just 40,000-odd rambling words about what it has meant to me to be doula and what I have learned about how doulas make a difference. It’s a little peek behind the scenes of our rather obsessive, crazy world, populated by the voices of mothers, fathers and doulas. Sitting here now, aching for Spring, feeling rather empty and deflated now the job of writing is basically over, it seems that the gestation and labour of this book was a long one. But actually, it was only last summer, leaning over a balcony in the south of France to catch a little 3G, that I saw an email that made my stomach lurch. The name Susan Last always makes me smile when I see it. I have been admiring her writing and editing skills from afar for a long time. Her blog has made me laugh and cry and shout in recognition many times. The books she writes and edits are right up my street. In short, I had a little girly crush. We had recently met for the first time in real life at the ABM conference and was excited to find she was just as I had imagined her – not a trace of affectation, with a genuine smile. So seeing her name pop up in my inbox that hot day in France was very welcome. It was opening and reading it that made my stomach do funny things. What was this? Was she asking me to write a book? For Pinter and Martin? P&M? The publishers of Michel Odent and Sheila Kitzinger? The publishers of almost all the books we doulas read and share and get excited about? And here was my girly crush Susan saying she’d be my editor? Susan Last, of ‘Stories to Inform and Inspire‘ fame? This was all sounding just a teensy bit grown up. There’s no denying I enjoy writing. I know a few of you have enjoyed my out-pourings over the years. I write to help others, but mainly as a catharsis for myself and a way to make sense of my crazy-doula life. I have always written privately too, as a tonic and a self-help tool. But undeniably, I find writing for an audience difficult. I tense up over every word and compare myself unfavourably to other wordsmiths. I can’t say it’s a soothing passtime. The world of birth, babies and breastfeeding is not the easiest arena to write in either: every syllable might offend someone, every paragraph incite accusations of judgement or assumption. The thought of a whole book of my words, with my name on, on a shelf, in a real life book shop…yikes, my palms were sweating and that lurching stomach definitely wasn’t the crepes from the night before. No. No, I can’t do that…no, it’s too much work, I don’t have time. I’m not good enough. I don’t know enough about the subject. Nope. I’ll tell her no and point her to some other wonderful doula-writers I know. But then my husband stepped in. He didn’t say much. He never does – not about my work, anyway. So when he said, “Do it. You’ll regret it if you don’t”, I started wondering. Can I? Should I? Shall I? So that was the rest of my summer, through the autumn and into the run up the Christmas. I wrote every spare minute I had. I wrote like no-one was watching, just revelling in the music of my thoughts and feelings and memories. I wrote mostly in bed under the duvet. A decade of doulaing poured out of my fingertips. 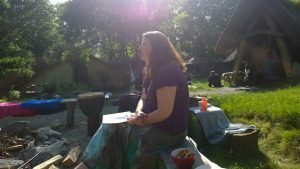 I asked my community of doulas and clients for their thoughts and feelings too – and with their usual generosity of spirit and enormous sensitivity and intellect, they honoured me with their voices. Each one deserved a place in the book and here was my biggest problem. I had been asked to birth a small book and here I was, gestating an enormous one! Me. Musing on all things doula. The process of reducing the word count resulted in sweat and moans and groans and tears. The birth pangs were horrid. I complained. I threw a strop at my family and some long-suffering friends. And then, there was Susan, swooping in to save me. Gently, calmly, she told me to send her the whole thing as it stood. It felt frightening to send her this thing, that had taken on a shape and a life of its own in my laptop. She had read and encouraged me as I had gone along, but now…well now she was going to do her thing, edit, shape, cut and finish. Like a hairdresser, I had to trust her implicitly as my words fell to the floor around me. My baby is now shorter, leaner, more to the point. There are voices and stories I love missing and I grieve for them a bit. I reckon I’ll have to use those fallen words as the basis of a few blog posts here. Ultimately I’m feeling pretty shy about the public attention this book will get me. But, like many, I’m feeling pretty passionate about the birth world at the moment. Something is definitely in the air. A change, a revolution even, is coming. Women are taking back birth. Standing up, moving, shaking those hips and pushing out their babies on their own terms. If I can raise my voice and support them, in a very small way, all that hiding under the duvet and my blushes as I imagine you lot reading it will be worth it. In the end, I believe in my title: Doulas do matter and I care that people find out why. So now I’m birthing my book. It’s in the hands of my marvellous midwife, Susan, and the wonderful people at Pinter and Martin. Once day soon, apparently, I will receive the final proofs. There is a cover design. It’s real. In the world. All I can hope is that you all treat my baby gently. So stupidly excited to read and savour every word of your baby Maddie! I’ll be under my duvet with my baby at the breast quietly taking it all in <3 Can't wait! I think that might be a rather large exaggeration, Rachel – but I appreciate the sentiment! Doula Spot sends congratulations! Looking forward to reading your labor of love!